Diana Arterian is the author of Playing Monster :: Seiche (1913 Press, 2017), the chapbooks With Lightness & Darkness and Other Brief Pieces (Essay Press, 2017), Death Centos (Ugly Duckling Presse, 2013), and co-editor of Among Margins: Critical & Lyrical Writing on Aesthetics (Ricochet, 2016). 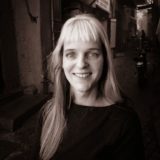 A Poetry Editor at Noemi Press, her creative work has been recognized with fellowships from the Banff Centre, Caldera, Vermont Studio Center, and Yaddo, and her poetry, essays, and translations have appeared in Asymptote, BOMB, Black Warrior Review, Boston Review, Denver Quarterly, and Los Angeles Review of Books, among others. Born and raised in Arizona, she currently resides in Los Angeles where she is a doctoral candidate in Literature & Creative Writing at the University of Southern California. She holds an MFA in poetry from CalArts, where she was a Beutner Fellow. 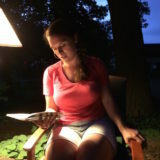 Anna Vitale is the author of Detroit Detroit​ (Roof Books), Different Worlds (Troll Thread), and several chapbooks including Unknown Pleasures (Perfect Lovers). Recent writing ​has appeared or is ​forthcoming ​in BathHouse Journal, Columbia Poetry Review, Jacket2, and ​Supplement. She​ lives in Brooklyn and ​hosts ​​the Tenderness Junction on WFMU. CANCELED — TALK — HOLDING FORGOTTEN READERS CLOSE: Four Black Women Reflect on African-American Literary Community.